PROPERTY DESCRIPTION: 187.4 acres located just east of El Dorado Kansas near the El Dorado Lake. 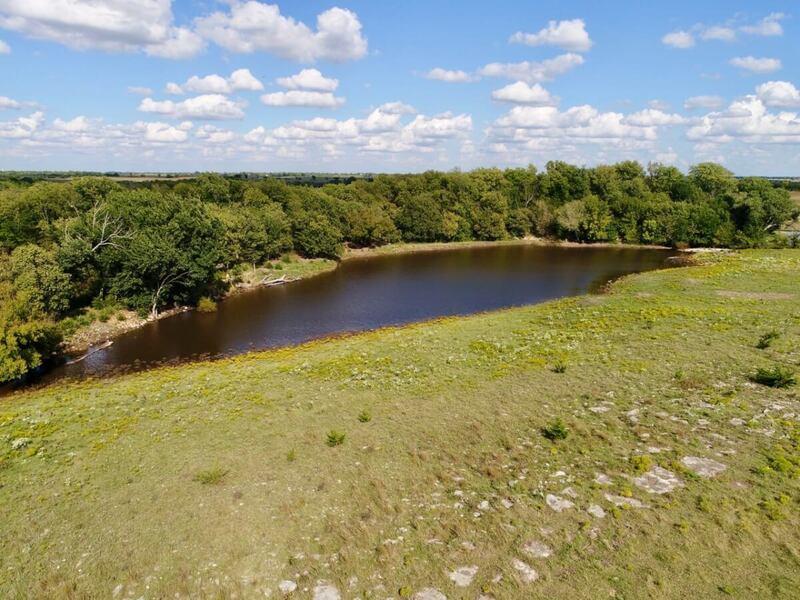 This diverse property has native Flint Hills pasture, really nice rolling hills and terrain, a good pond, wet weather draws and springs, and a windmill over a water well. Access is just a few hundred yards from blacktop HWY 54, but the terrain makes the property feel very secluded. Scattered timber offers good Kansas Whitetail Deer, Turkey, and Quail habitat. Great location, and an excellent combination of Agriculture and Recreation. Invest in Land! LEGAL DESCRIPTION: Beginning at the Southeast corner of the Northeast Quarter of Section 6, Township 26 South, Range 6 East of the 6th PM, Butler County, Kansas; thence North 105.25 rods; thence West 117 rods; thence North 54.75 rods; thence West 3 rods; thence South 160 rods; thence East 120 rods to place of beginning; and the East Half of the Southeast Quarter of said Section 6, EXCEPT a tract being that part of the East Half of the Southeast Quarter of said Section 6 lying South and West of the El Dorado Eureka Highway, also known as U.S. Highway #54. Also, EXCEPT a tract beginning at a point 30 feet North of the Southeast corner of said Section 6; thence North 585 feet; thence West 740 feet; thence South to U.S. Highway #54, as now located; thence Southeasterly along said highway to point of beginning. Subject to public road AND The West Half of the Southwest Quarter of Section 5, Township 26 South, Range 6 East of the 6th PM, Butler County, Kansas, EXCEPT a tract beginning at the Southwest corner of said Section 5; thence East 544.5 feet; thence North 1184 feet; thence West 544.5 feet; thence South 1184 feet to the point of beginning. Subject to public road. LAND LOCATION: From El Dorado, East on HWY 54 1 1/2 Miles to SE River Rd, then northwest to the property. The property borders SE River Rd and SE Poor Farm Rd. 2017 REAL ESTATE TAXES: $501.70. TERMS: Earnest money is $25,000 down at the conclusion of the Auction with the balance due upon Sellers submission of merchantable title and closing. Closing date shall be on or before November 30, 2018. Closing fee and title Insurance fee will be split 50/50 between Seller and Buyer. Selling subject to easements, restrictions, roadways and rights of way. This property is not selling subject to financing or inspections. Interested buyers need to view the property prior to the date of the auction and have financing available and any inspections performed prior to bidding. All pertinent information is available upon request. All announcements made the day of the auction take precedence over any other announcements or printed material.